Product prices and availability are accurate as of 2019-04-24 16:11:59 CDT and are subject to change. Any price and availability information displayed on http://www.amazon.ca/ at the time of purchase will apply to the purchase of this product. Audio sources come in all shapes and sizes. 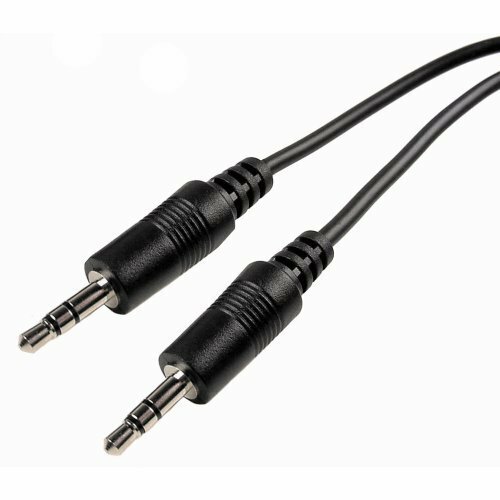 This 3.5 mm stereo male to male patch cable has been built for clean signal transfer and durability. Each cable has two nickel plated plugs, each with a molded strain relief. This increases longevity for a cable that you can count on. Compatible with DVD players, laptops, portable CD players, MP3 players, iPod, PC.Projectors all have one thing in common 3.5mm stereo audio output jack. Newer home theater receivers, computers, laptops, and even some. Amplifiers feature a 3.5 mm audio input jack for connecting to sources for signal. 6 Feet 3.5mm Male to Male Stereo Audio Cable. Industry standard 3.5 mm ( 6 feet ) patch cable, the cable's flexible jack is perfect for tight spaces; Easily connect a speaker system or microphone, provides the solution needed to connect high performance systems; 6 Feet long sturdy 3.5 mm aux stereo cable wire is ideal and convenient for connecting portable audio devices all shapes and sizes; Easily connect your iPod or other MP3 player to a car stereo 3.5mm audio in jack, ensuring reliability and reducing signal loss and noise; Compatible with Apple Device, Android smartphones, DVD players, laptops, portable CD players, MP3 players, iPod, PC.